1. Put a saucer or small plate in the freezer, then preheat the oven to 170°C, gas mark 3. Wash 3 x 400ml jars with screw-top lids in hot soapy water. Rinse and dry, then put both jars and lids in the oven for 10 minutes to sterilise. Turn the oven off but leave the jars and lids in the oven to keep warm. 2. Put the fruit, jam sugar, lemon juice, lemon zest, vanilla pod and seeds (but not the vanilla extract, if using), and 120ml water in a large pan (or jam pan) and set over a low-medium heat, stirring until the sugar is completely dissolved. Turn the heat up to medium and simmer the jam briskly, stirring often, for about 20 minutes, adding the vanilla extract, if using, about 5 minutes towards the end. To check the jam is ready, remove the saucer from the freezer and add a little jam – it should wrinkle on the surface when pushed with a fingertip. At this point, remove the lemon zest strip and vanilla pod, if using. 3. 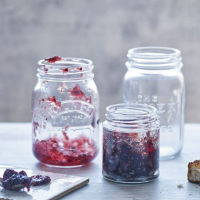 Spoon the jam into the warm, sterilised jars, leaving a 1-2cm space at the top. Top with discs of waxed paper, if liked, screw the lids on tightly and cool to room temperature. Add date labels and store in a cool, dry place for up to 3 months.